Hello Hacker News! We're now free for YC startups, contact us to get your free account set up! Keeping track of hundreds of YouTube channels and their videos has always been a big challenge. Singing in and out of hundreds of YouTube channels to download their analytics data every month is a pain and doesn't even give you insight into channels you don't own. That's where Tubelytics comes in. We give you the ability to track any channel you like. And lots of them. As a multi-channel network, you want insights into how your network partners are doing vs. their competing channels. Whatever type of videos you publish, you'd like to see the results of what you upload over all your channels. That's the information the Tubelytics dashboard is designed to give you. As a music label, you want to see which of your artists are fastest growing and which tracks are breaking through and going viral. As an advertising agency, to know which channels to advertise on, you need to figure out which ones are doing best in their individual categories. We track your channels every second of the day. That means every day, we can show you predictions of end-of-day metrics (like how many views your channels will probably get) even if the day just started! 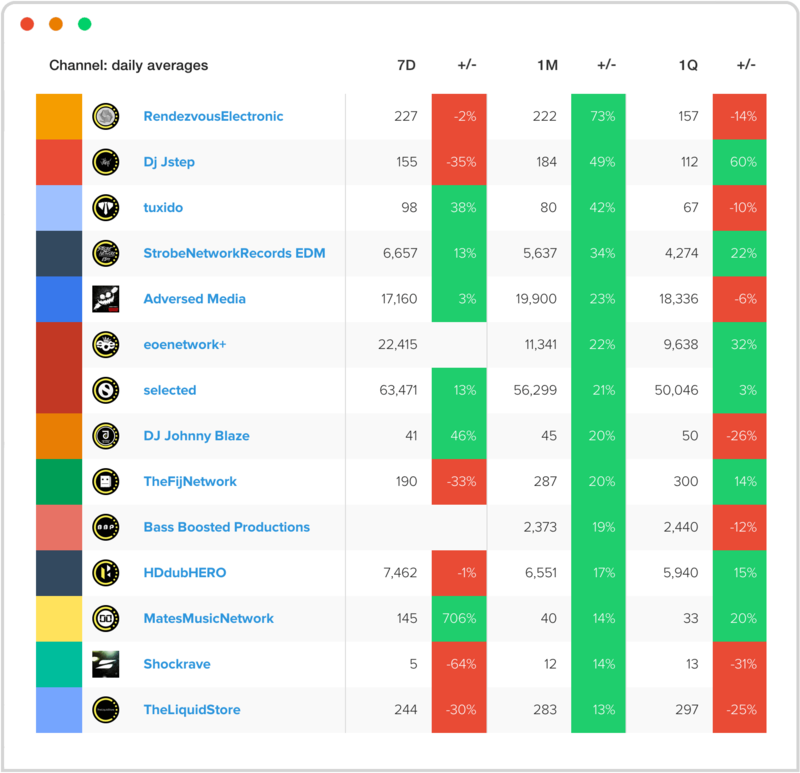 We give you a quick overview of the performance of your entire group of channels, videos or network and tell you which channels and videos do best and are fastest growing. 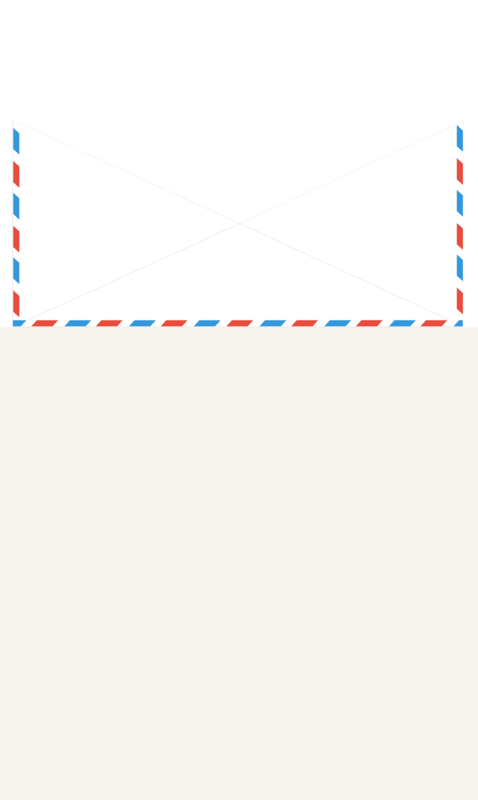 We can send out daily, weekly or monthly reports so that you can always be up-to-date. Exportable data includes metrics such as views, subscribers, uploads, estimated earnings, views per video and subscriber per video. See a sample of our CSV exports. You can export aggregate data for an entire group of channels (such as a network) to an individual channel. Instantly export daily, weekly and monthly data from your dashboard and use it in your organization to execute your own analysis and report from. "Tubelytics lets us monitor trends in the music industry while keeping a close eye on our YouTube partners growth within our network. It is has become an important tool in our day to day operations." "With Tubelytics, we discovered which of our music channels do best and its predictive insights helped us see in which music genres we should invest in the future. The reports help us steer our content strategy daily." 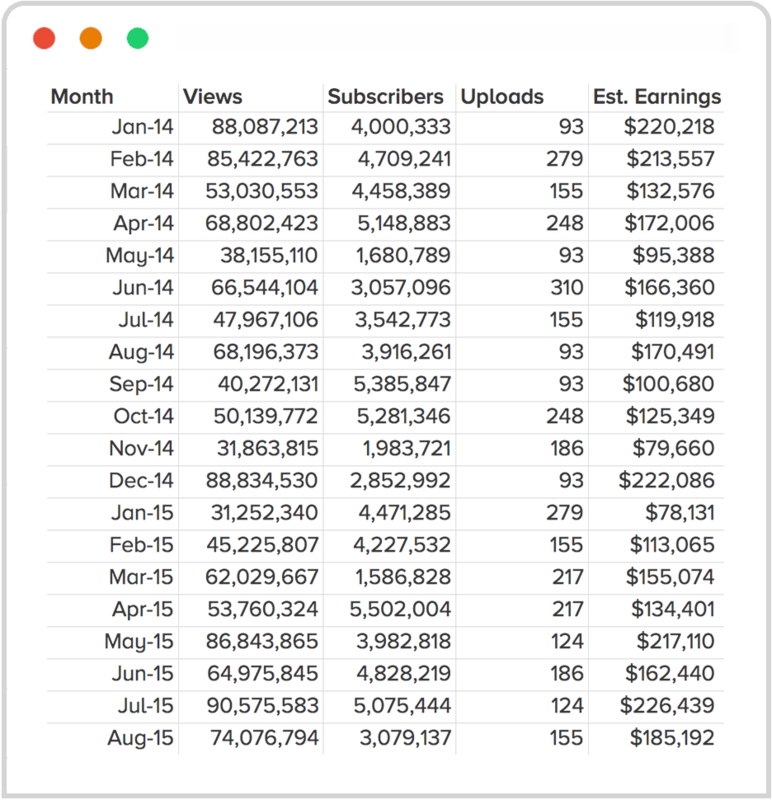 "Running a network of YouTube channels is challenging as it means keeping up-to-date with each channel's stats. Tubelytics lets us do that while also providing us with insights into competing channels' performance." As one of the first members of the YouTube Partner Program, I have built up many large YouTube channels and networks. I had no way of keeping track of the performance of all my channels and their competition though. 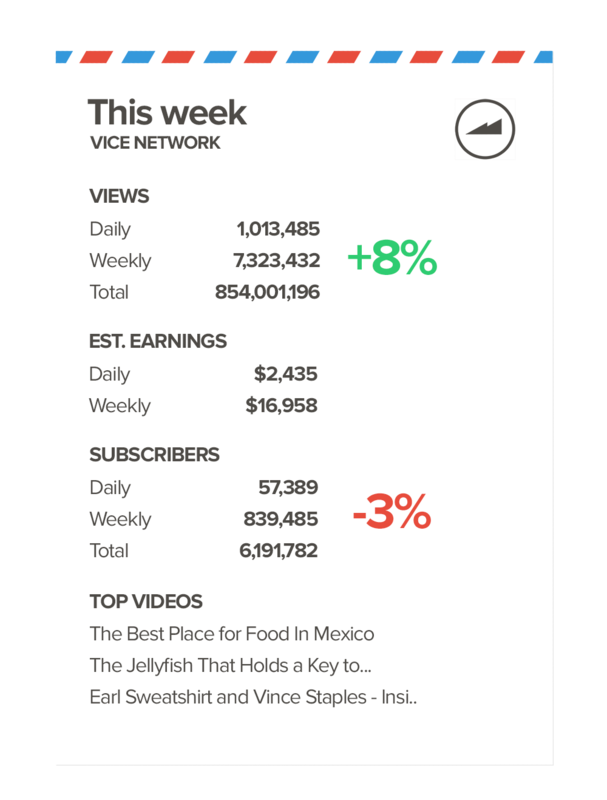 So, I started developing my own statistics app for YouTube. This tiny app grew into what you're looking at today. Tubelytics, a real-time analytics dashboard which can help you improve your network, channel and video performance. So, try it out and let me know what you think! What kind of metrics do you provide? We provide you with daily views, new subscribers, new subscribers per view, new uploads, views per video, Daily earnings (based on average CPMs), earnings per video and earnings per subscriber. Do I need to connect my YouTube account? No, you don't need to connect your YouTube account to use Tubelytics. We use publicly available data and therefore don't need access to any of your accounts. Can I track any channel? Yes! You can track any YouTube channel you want. You don't need to own the channel to see its metrics. You can even track competing channels. Or channels you do own but which aren't connected to your YouTube's CMS account. If we haven't tracked a channel before, it may take a few days to collect enough data for it. Why should I pay for Tubelytics? Is it worth the money? 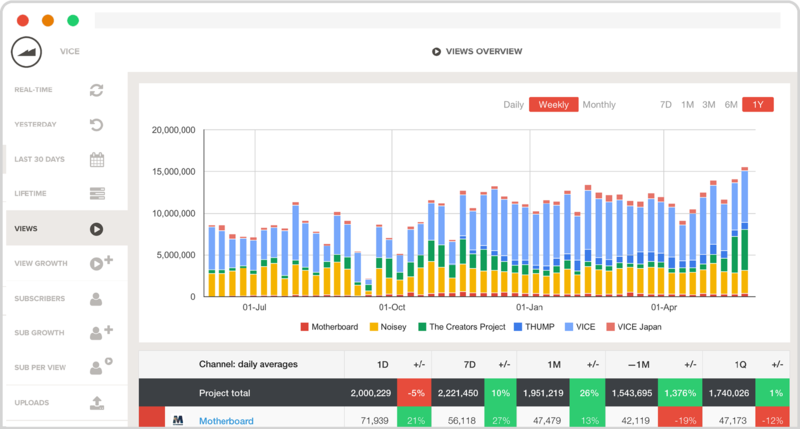 Tubelytics lets you understand your YouTube channels performance. Aggregating that data yourself can take hours every day. With Tubelytics, you have all your analytics in one dashboard 24/7 with no effort. Tubelytics is perfect for video publishers, record labels, multi-channel networks, advertisers and major media brands that would like to track their YouTube properties. How is Tubelytics different from YouTube Analytics? YouTube has its own analytics service. However, it only lets you track your own channel. That means signing in and out of multiple channels daily to get an idea of how your channels are performing. Tubelytics lets you track any channel, even if it's not connected to your YouTube account. That's perfect for businesses with multiple YouTube properties. If at any moment during the 90 days after you've started your subscription you're not satisfied with Tubelytics, you can just send us a message, and we'll refund all your paid subscription fees. Can I request a feature I need? Yes! In fact, Tubelytics was built on feature requests. We love to improve Tubelytics based on your feedback. You can add your ideas here.